TrulyDRY Carpet Cleaning Inc. is the sole owner of the information collected on this site. We will not sell, share, or rent this information to others in ways different from what is disclosed in this statement. Generally, we collect the domain name, email address, Uniform Resource Locator (URL), and Internet Protocol (IP) address of visitors to our website, those who communicate with us via email, and those who subscribe to our E-News newsletter. TrulyDRY Carpet Cleaning Inc. collects aggregate information on what pages customers access or visit, as well as information volunteered through surveys or site registrations. We may share personally identifiable information, such as email addresses, with a service provider that we hire to send emails and newsletters regarding TrulyDRY Carpet Cleaning Inc. products and services. Other than such a service provider, TrulyDRY Carpet Cleaning Inc. will only share personal identifying information with third parties with your permission. We may share non-personal information about our users with advertisers, business partners, sponsors, and other third parties, without your permission. However, we only divulge aggregate information, such as how often the average user visits www.trulydry.com. To use certain parts of this website, a user may be required to complete a registration form. During registration a user is required to give their contact information (such as name and email address). This information is used to contact the user about the services on our site for which they have expressed interest. 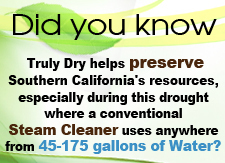 TrulyDRY Carpet Cleaning Inc. may offer products or services from our website. We request information from the user on our order form. Here a user must provide contact information (like name and shipping address) and financial information (like credit card number, expiration date). This information is used for billing purposes and to fill customer's orders. If we have trouble processing an order, this contact information is used to get in touch with the user. A "cookie" is a piece of data stored on the user's hard drive containing information about the user. We use may use "cookies" to store visitor preferences, record session information, record user-specific information on what pages users access or visit, alert visitors to new areas that we think might be of value to them when they return to our site, record past activity at a site in order to provide better service when visitors return to our site. This web site contains links to other sites. Please be aware that TrulyDRY Carpet Cleaning Inc. is not responsible for the privacy practices of such other sites. We encourage our users to be aware when they leave our site and to read the privacy statements of each and every web site that collects personally identifiable information. This privacy statement applies solely to information collected by this Web site. If a user wishes to subscribe to a newsletter or other TrulyDRY Carpet Cleaning Inc. publication, we ask for contact information such as name and email address. Users are not required to subscribe to our publications as a condition for using our website. From time-to-time our site requests information from users via surveys. Participation in these is completely voluntary and the user therefore has a choice whether or not to disclose information. Information requested may include contact information (such as name and shipping address), and demographic information (such as zip code, age level). Contact information will be used to notify the winners and award prizes if applicable. Survey information will be used for purposes of monitoring or improving the use and satisfaction of this site.